What everyone agrees on is that the world’s oceans contain too much plastic. An estimated 8 million tons are deposited in them each year and about 250,000 tons wind up in one of five oceanic garbage patches, heavily polluted circular currents. There the plastic kills millions of turtles, birds, dolphins, and other creatures that become entangled in it or accidentally eat it, ingesting toxins that can travel up the food chain to humans. System 001 is a tiny version of Slat’s idea. 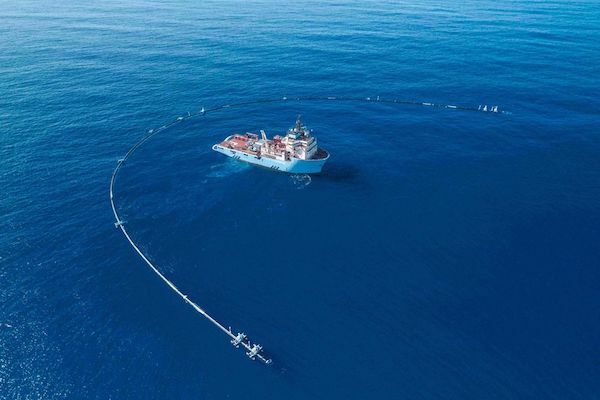 Basically, he wants to drag the oceans, using a fleet of 40 floating booms to dangle 3,000-foot-long curtains of canvaslike fabric that will circle the garbage patches, pushed by wind and current, and scoop up plastic as they go. Every few months a ship will come to collect the refuse and bring it to shore. Some will be recycled and the rest burned for fuel. The hope is that this will help the operation pay for itself and scale up. The plan’s simplicity and bravado has earned Slat a wide audience, including Leonardo DiCaprio, Mark Ruffalo, and 2.8 million people who’ve watched his TEDx talk on YouTube. He says it’s also helped his company attract a talented team of more than 80 employees. Before Slat, few imagined any single solution could tackle the problem of ocean plastic. Charles Moore, the researcher who first identified a garbage patch in the northern Pacific, said trying to clean one up would bankrupt any country that attempted it. Environmental groups have mostly lobbied industry to produce less plastic and consumers to use less. Although reuse and recycling make a difference, it’s tough to argue with Slat when he notes that the garbage patches are still growing. Efforts at moral suasion are futile, he says—“they go against innate feelings and desires.” Which is to say, people are lazy, and it’s easier to do the job for them. For years, experts have found Slat’s science wanting and his I-alone-can-fix-it attitude worrisome. When he was in high school, his plan was to anchor a large boom to the seabed. Marine biologist Miriam Goldstein, who led an expedition to study plastic pollution in the North Pacific patch, noted on an academic email chain in 2013 that the device stood little chance of working: It would have to be impractically large, the boom would be unlikely to collect plastic in strong winds or waves, and the mooring cables would have to reach twice as deep as the deepest on record. Slat’s response, a 535-page feasibility study, was strikingly technical but left Goldstein and Martini with a lot of new questions. Responding to critics, Slat’s team enlisted CSA Ocean Sciences Inc., a marine environmental consulting firm, to assess its prototype. CSA’s report, published earlier this year, concluded that Ocean Cleanup’s plan carried a significant risk of environmental harm if it went astray and couldn’t be recovered, but that the potential benefit outweighed the risk. Many scientists remain unconvinced. In June, David Shiffman, a marine biologist at Simon Fraser University in British Columbia, surveyed 15 ocean-plastics experts around the world and found that none unreservedly supported the project. Five of them would describe it as “a very bad idea with little or no redeeming value,” he says. When Slat’s original seabed-anchored design proved unworkable, the team replaced it with a version that weighted sea anchors would stabilize. The current wind-and-wave-powered model replaced the sea anchors when they presented their own problems. And even the version en route to the Pacific patch is unlikely to stay there, because objects that float high in the water, unlike submerged flotsam, tend to be driven clear by the wind. “This is why submerged microplastics and fishing nets gather in the garbage patch while the Alaskan coast is clogged with Styrofoam buoys and PET bottles,” says Nikolai Maximenko, an ocean researcher at the University of Hawaii. Spokesman Dubois says Ocean Cleanup expects the offshore supply ship hauling System 001 to be able to pull it back on course as needed. But keeping a bunch of ships around to babysit a fleet of the boom systems would make the whole project far more expensive. In Slat’s 2012 TEDx video, he said his device would be able to completely clean the garbage patch in the North Pacific in just five years. Today, his company says a fleet of its as-yet-unbuilt 3,000-foot-long models could clean half the patch in that time. The company’s website says “combining the cleanup with source reduction on land paves the road towards a plastic-free ocean by 2050,” but as Dubois acknowledges, virtually all the benefit would be achieved through the difficult, unsexy work of keeping plastic out of the ocean in the first place. Very interesting piece Jeff. I have long been interested in the gyre clean ups. the tone of the comments by the experts seems like they are all rooting against the guy. that saddens me. He started his idea at 16 years old and raised $30 million. that is freaking awesome. I would imagine what he can do at his next-go around. And while it’s true that clean up is only a fraction of the overall pullution problem, it’s still a good idea to clean it up. The plastic is a disaster to marine life. So I find it odd that people would discourage clean up because they’d rather focus on prevention. That would be like me finding garbage in my yard and instead of cleaning it up, just letting it sit there until I started using less garbage. It’s nonsense. I hope his can do attitude helps the problem and succeed or fail, he has decades of his life left to get better and better at making the world a better place. 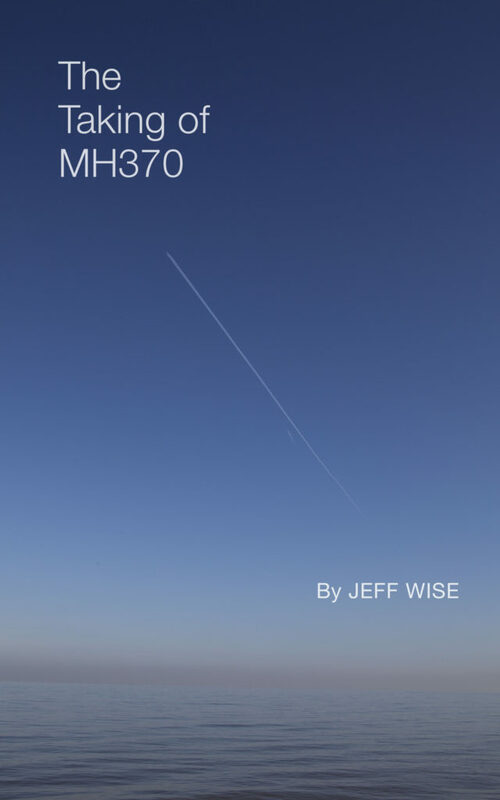 btw: here’s an article relating the IO garbage patch to MH370: https://news.nationalgeographic.com/news/2014/04/140404-garbage-patch-indian-ocean-debris-malaysian-plane/ . I’ve always wondered how it might affect the debris. Seems to be an underdiscussed topic IMO. Very interesting…I will be interested to hear how the effort works out. Ultimately, the question is whether we should burn, recycle or bury/landfill wastes including plastics. As an engineer, I feel it is wasteful and uncivilized to not, after recycling, recover the energy value of the wastes. I do not favor raw-trash landfills, and mostly where I have lived we use trash-to-steam. In the case of New Jersey, I helped years ago as a very active concerned citizen to lobby against the massive landfills we had, in favor of recycling and energy recovery. Unfortunately, much of the plastics-in-ocean issue is caused by countries with no waste handling whatsover, so everything just goes into the nearest river. Reportedly, 90% of the plastic that reaches the world’s oceans gets flushed through just 10 rivers: The Yangtze, the Indus, Yellow River, Hai River, the Nile, the Ganges, Pearl River, Amur River, the Niger, and the Mekong (in that order). @TBill, Great point. A propos your blog post (which I highly recommend), I think there is a lot of uncaptured value in discarded plastics. I read recently that so many Chinese manufacturers relied on recycled US plastics that when the Chinese government shut down its importation because too many of the plastics were too dirty, Chinese companies started investing in plants to process and clean US recyclables. I wonder if, along with trying to educate the people living alongside these rivers, it might be possible to encourage entrepreneurs to profit from the recovery and processing of plastic waste? Yes, for sure we should give incentives for that…I actually did quite a bit of research in my career on plastics recycling. Technically there are a multitude of feasible recycling technologies…it is not a lack-of-technology problem. UN should probably have a waste management effort (if they do not already have one) and accept donations. Well, if 90% of the stuff is coming out of ten rivers, then the placement of the containment devices should be obvious.